RIDE A 4D MOTION CONTROLLED CHAIR ON A TOUR AROUND THE WORLD AND THEN TRANSITION TO A THRILLING ROLLER COASTER RIDE...FULLY IMMERSED! 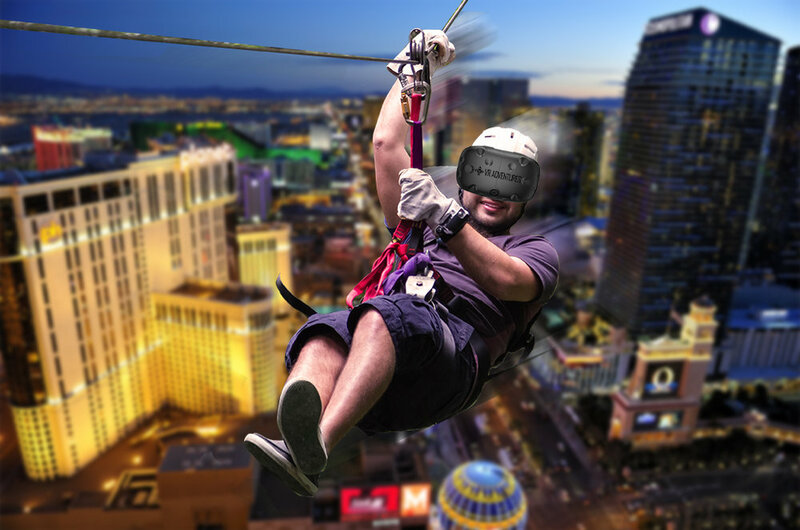 FLY OVER THE LAS VEGAS STRIP LIKE A SUPERHERO. WIN PRIZES AS YOU FLY THROUGH HOT AIR BALLOONS AGAINST THE CLOCK! ZIPLINE ACROSS CAESARS PALACE FROM 60 STORIES ABOVE THE GROUND. HOLD ON TIGHT! WALK THROUGH A HAUNTED HOUSE FILLED WITH THINGS SO SCARY YOU'LL WONDER IF YOU'LL EVER SLEEP AGAIN! TRY TO SURVIVE WAVES AND WAVES OF ZOMBIES COMING AT YOU FROM ALL SIDES. SHOOT AS FAST AND ACCURATELY AS POSSIBLE. YOU DARE NOT TAKE THE TIME TO BLINK!